Welcome to the Ecseghy Musikhaus! As soon as you open the door of our shop you are transported into a different world, the world of music. The warmth that our instruments radiate will at once lead you to want to play them. As well as our huge selection of instruments you can find all kinds of equipment, both for beginners and advanced musicians, from sheet music, violin cases and resin right through to guitar strings. Your child, for instance, can find the instrument that they are most interested in learning to play. The advanced musician can find in our shop the appropriate professional instrument, and the artist is sure to find in our large selection of master instruments the ideally suited instrument for his ability. double basses) as well as bows and strings. 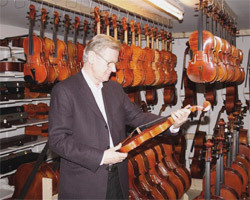 In addition you can find guitars, flutes and pianos. you are still happy with your instrument and know that you made the right choice, then we have reached our goal. working with great care, and laying great value on quality, tonal optimisation and final appearance.